As the Eid holiday approaches Cairo is working to manage parallel conflicts in Gaza and Yemen. In recent days Cairo has been playing host to representatives of leading Palestinian factions with the aim of managing chronic Palestinian divisions and building a solid base for a sustainable truce between Israel and Hamas. Informed Hamas sources say some advances have already been made in bridging the gap between Hamas in Gaza and the Ramallah-based Palestinian Authority (PA). Egyptian and PA sources, however, are less forthcoming over the possibility of Egypt securing a deal between Hamas and the PA.
“We are working in good faith with the Egyptians and we are hoping that the PA will also be forthcoming. We are hoping to see a comprehensive agreement sometime soon,” said Ahmed Youssef, a Hamas leader who spoke to Al-Ahram Weekly on the phone from Gaza. The most contentious point in the deal, according to both Hamas and PA sources, revolves around power sharing mechanisms between the two sides. According to Youssef, Cairo is working out the details “bit by bit”. Some points, he said, have been settled while others remain pending. A deal between Hamas and the PA is essential in the long term but not necessarily a prerequisite for the initial truce — envisaged to be in force for five years — between Israel and Hamas that Egypt is working on, say Egyptian sources. On Monday Israeli Minister of Defence Avigdor Lieberman said a conflict with Gaza is not about “whether but rather about when”. The past few days have seen high levels of tension that only declined after a speedy Egyptian intervention with the direct involvement of the UN. Regional and UN sources say that the situation remains very fragile. Egypt has been working hard, with an apparent green light from the US, to secure a long-term truce between Hamas and Israel in anticipation of the launch of a major economic/humanitarian plan to relieve conditions in the overpopulated and impoverished Gaza Strip. Exhaustive discussions were conducted in Washington in August during consecutive visits by the head of Egyptian Intelligence and the foreign minister. The economic/humanitarian plan is part of a larger political scheme that the US administration has been working on with its regional allies to end the Palestinian-Israeli struggle. However, due to the “state of unpreparedness” on the part of all the concerned parties it has been agreed to start with Gaza. “I cannot say that the so-called deal of the century is off or that it is on the backburner. What is clear is more work is still required. It might come shortly before the UN General Assembly or it might not. Things are still cooking,” said an informed regional diplomat. Egypt remains adamant in its refusal of the repeated Israeli suggestion Cairo take administrative control of Gaza. According to the same diplomat it has shown more openness, however, on what it could do alongside the UN and Hamas in connection to administrative and security arrangements related to the Gaza deal. Meanwhile, President Abdel-Fattah Al-Sisi has met with both the Yemeni President Abd Rabbo Mansour Hadi and the Crown Prince of Abu Dhabi and Deputy Supreme Commander of the UAE Armed Forces Mohamed bin Zayed to discuss the situation in Yemen. On Tuesday Al-Sisi travelled to Saudi Arabia to meet King Salman and Crown Prince Mohamed bin Salman in the city of Neom. Egyptian diplomatic sources say the meetings come against the backdrop of “increased Houthi attacks” against the Arab coalition supporting Hadi’s forces. Sources say Egypt is still committed to keeping Egyptian troops out of Yemen. “The agreement now is that Egypt will have a bigger role in managing Red Sea security but the details will have to be discussed in the next few days,” said an informed Yemeni source who asked for his name to be withheld. Egypt is a member of the Saudi-led Arab coalition that for four years has been fighting to reinstall Hadi and end the insurgency of the Yemeni Houthis who are supported by Iran. 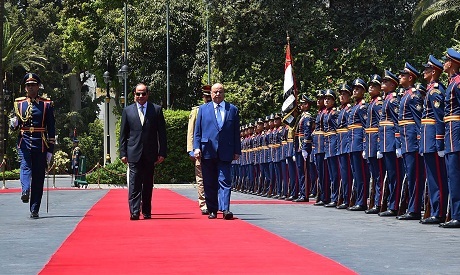 However, unlike other Arab partners, Egypt has no troops on the ground in Yemen though President Al-Sisi has repeatedly reaffirmed Egypt’s commitment to the security of its Arab Gulf allies, especially its closest political partners the UAE and Saudi Arabia. Riyadh has regularly been the focus of international criticism for its actions in Yemen. Last week it was accused of responsibility for an air strike that killed over 40 Yemeni children on a school bus. Saudi Arabia, says an informed Riyadh-based European diplomat, “really wants to see an end to this four-year war but as far as the Saudis are concerned that can only come when Hadi is firmly ensconced in power”. Saudi Arabia is particularly worried about the conflict ending while the Houthis are still in a position to challenge Hadi. It is not something the Saudis could countenance, given that Riyadh views the Houthis as the cat’s paw of its archenemy, Tehran. “The Saudis have always been concerned about the influence of Iran in Yemen, which it sees as its backyard. Now, with the increased pressure the US is putting on Iran, the Saudis are growing concerned about how the Houthis will act against Saudi Arabia not only in its capacity as a regional adversary but also as a close ally of the US. Recent Houthi attacks and threats against Red Sea security are taken very seriously by the Saudis,” said a Riyadh-based European diplomat. In a joint press conference with Hadi in Cairo on Monday Al-Sisi said that Egypt would not allow Yemen to be used as a power base for non-Arab forces.